I stumbled across this book and picked it up solely based on it's cover. Yep, I am that type of book-buyer. Covers draw me in, then the blurb on the back snags me. My favorite covers are really basic, just like this one. I prefer not to see the Hero or Heroine, I want the freedom to make them up in my own mind. It's the way I write too, without a lot of detailed description....and I digress:) Let me get back on track with Pam's book, Stealing Jake. I truly enjoyed Pam's style of writing; smooth and easy, filled with laughter and love. Pam pulls you in to her entire cast of characters. Jake is a true gentleman with a crooked smile and gleam in his eye, Livy is sweet and savvy, the children tug at your heart...I could go on but the best thing to say is: buy the book, sit down and enjoy it for yourself. I have this one, but haven't read it yet. I'm a book cover kind of gal, myself. What's next on your book list? I know I shouldn't, but I judge books by their cover, too. There are SO many great ones out there in the Christian market! Glad to know that you enjoyed this book, Susan! I've been hearing lots of good things about it. 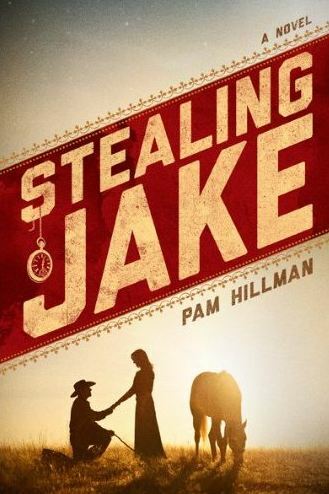 Susan, just kickin' around the internet tonight and stumbled across your great review of Stealing Jake. I'm so glad you loved the book and REALLY appreciate the shout-out on your blog.